Launch your applications quickly from anywhere without moving your mouse. Radian takes advantage of the radial interface to help you locate what you need without delay. No matter what program you're currently working with, a continuous right-click or keyboard shortcut will bring Radian right up at the tip of your cursor. Easily drag & drop all the different shortcuts you use to one of Radian's four slices. 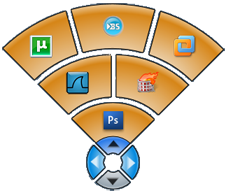 Each slice can be customized to be any color and contain different types of shortcuts. Radian has four slices, one at each direction allowing for quick access to your shortcuts taking advantage of muscle memory. Copyright © 2011 David Berlin.